Reminiscent of the Turkish baba ganoush, this homey, hunger-satisfying dish consists of smoky eggplant, simmered in a blend of caramelized onions and tomatoes. There is something so addictively moorish about this dish that it is the perfect accompaniment to almost anything. Try it with naan, couscous, a bowl of quinoa or use it as a filling for a tortilla wrap. 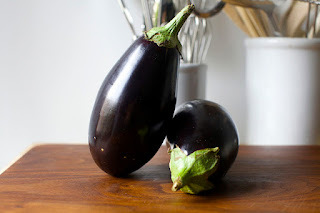 Place the 2 eggplants on a baking tray and bake for 60 minutes at 200 degrees C. Turn them over after 30 minutes to ensure all sides are well done. Remove from oven and keep aside to cool. Meanwhile, heat oil in a non-stick pan and add the dry red chilli and cumin seeds. Allow them to splutter for a minute and add the onions, ginger and garlic. Sauté for 10 minutes till the onions start turning golden. Do not wait for them to brown completely. While the onions are browning, we can focus on the baked eggplant. Once they have cooled, peel the skin with your hands. This should come off quite easily. Discard the skin. Roughly chop the peeled eggplant. Once your onions turn golden, add the chopped eggplant and tomato. Keep stirring. Add the turmeric, chilli powder, coriander powder, ½ teaspoon curry powder and a teaspoon of salt. Mix well and cover for 15 minutes on low to medium heat. After 10 minutes, open the cover and stir to ensure even cooking. Scrape the bottom of the pan well. Once you have kept the eggplant covered for 15 minutes, it’s time to cook it without the lid on. Yes, this dish does require patience, but trust me the results are outstanding. Now turn the heat to medium high and stir uncovered for the next 12-15 minutes. After 10 minutes, add the remaining ½ teaspoon curry powder and check for seasoning. You do not have to stir continuously but every 3-4 minutes should be ok. The eggplant will be well mashed by now and will also start getting browned. Continue this for another 5 minutes and then turn off your heat and leave covered. 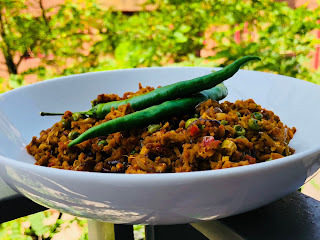 Serve hot whenever hungry and garnish generously with chopped coriander. You can enjoy this with naan or create a delicious tortilla wrap using the eggplant as a stuffing.